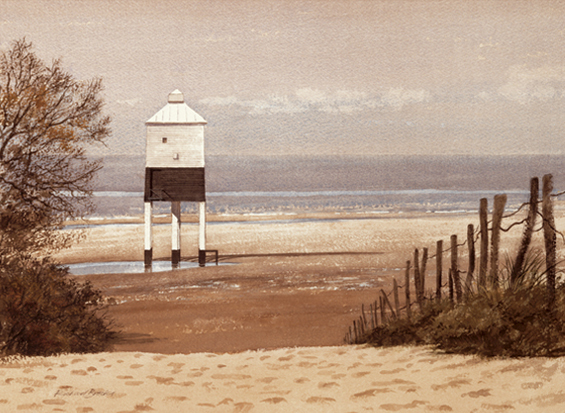 Peaceful beach scene featuring an old lighthouse, loyally keeping watch for seafarers, long after it has been replaced by a modern lighthouse further up the coast. Giclee print on German Etching paper from an original watercolour. Limited edition of 150, each print signed and supplied with a certificate of authenticity. Print sizes 75 available medium approximately medium 14inches by 10inches or 36x26cm excluding mount. Mounted and cellophane wrapped ready to frame �69.00 plus postage and packing. Print sizes 75 available small approximately medium 9inchesx7inches or 24x16cm excluding mount. Mounted and cellophane wrapped ready to frame �39.00 plus postage and packing.